Marc Hamilton is Vice President of Solutions Architecture and Engineering at NVIDIA, the AI computing company. 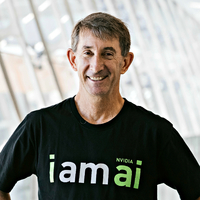 Marc leads the worldwide solutions architecture and engineering team working with NVIDIA’s customers and partners to deliver the world’s best end to end solutions for artificial intelligence & deep learning, professional visualization, and high performance computing. Marc holds a BS degree in Math and Computer Science from UCLA, an MS degree in Electrical Engineering from USC, and is a graduate of the UCLA Executive Management program.